In cartography, a contour line (often just called a "contour") joins points of equal elevation (height) above a given level, such as mean sea level. A contour map is a map illustrated with contour lines, such as the USGS topographic map below, which thus shows valleys and hills, and the steepness or gentleness of slopes (Source: Wikipedia). Over the years, NCTCOG has been partnering with remote sensing consultants to create contours for varying parts of the 16-county region. The largest project to date was in 2007, when contours were created from ACS (autocorrelated surface) data for all of NCTCOG’s 16 counties. 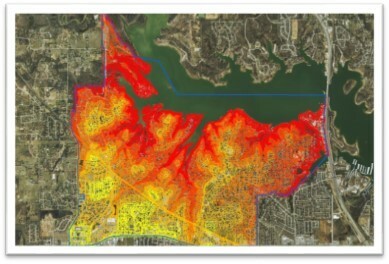 For future contour projects, NCTCOG’s chosen consultant will utilize 0.5-meter LiDAR data to create 2-foot contours for any defined project area. Breaklines can be added to better depict edges of drainage features, road edges, and other sharp breaks or discontinuities in the terrain. Data will meet or exceed NMAS vertical accuracies for 2-foot (1.0’ RMSE). If requested, the consultant will apply smoothing to create a more traditional looking contour dataset. If desired, an entity may choose to have 1-foot contours created. However, 0.5-meter LiDAR is not considered dense enough to consistently produce accurate 1-foot contours, so the consultant will need to use surface data from 3-inch imagery to bolster the LiDAR data if 0.5' RMSE is required. Contour data are available in GIS (shapefile) and CAD (DWG) format and contain an elevation attribute that will hold the photogrammetrically obtained elevation. The scope of any contour project is dependent upon the needs of that year’s participating entities. 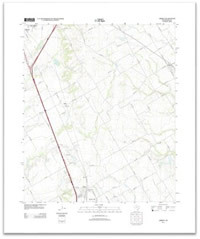 Contour data from previous project years may be viewed, printed, and purchased in digital format after a project completes at www.dfwmaps.com. For more information about contours, contact Shelley Broyles at 817-695-9156 or via email.